The following dreams are extracted from my dream journal, which I started keeping in 1965. David Meltzer has been a regular figure in my dreams, usually representing the ideal poet. Meltzer brought me out of my isolation when he published some Jewish parables I wrote in an early issue of Tree. In 1974, Meltzer published my first book, A Blessing Over Ashes, with Tree Books. These were imprinting experiences, and my later meetings with David were always memorable. As these dreams indicate, Meltzer has been a powerful influence in my life, and a model of what a poet should be. Tina Meltzer gives birth years overdue. Her child is as large as a four- or five-year-old and very handsome, resembling his father, David. When told that his name is Hyman he immediately repeats it. David and Tina leave him with me for a short time. While he sleeps I study his eyes, which are incredibly beautiful. It occurs to me that he is an angel, who will live among us for a short time. David Meltzer talks to me about Judaism during a long session in a one-room log cabin. David Meltzer comes to visit me. At first we talk business and then we are in a train in St. Louis and he embraces an old woman he meets in it, that I never would have paid any attention to. When he comes back he is wearing a pair of glasses, the frames of which quickly disappear, leaving only the glass. The two of us go to sleep, both lying on our backs, slightly turned to the right. In a short time I notice that a pair of glasses without frames has appeared in my eyes. I look up and notice that we are facing the moon, and from that position it appears that there are two moons, although this can only be seen from that precise angle. Otherwise, the second moon only appears to be a cloud in the proximity of the moon, which is illumined by it. I wake Meltzer, who isn't really sleeping, and tell him about both the glasses and, almost offhand, the two moons. I told him that perhaps we were destined to be together at this time. He then said, with deep feeling, "I had hoped to God that we would feel close this time." As he does I feel a tremendous bond between us. I wake with a powerful emotion that I feel most strongly in my chest. 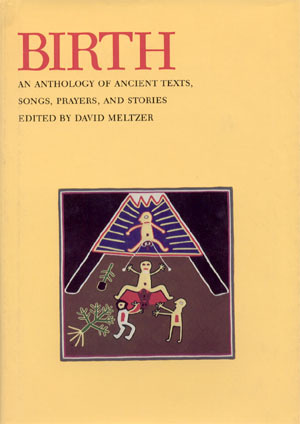 I dreamed that a friend of David Meltzer put together a book of poems selected from his books -- this friend's favorite. I read the book and was very impressed with the poems, although I didn't recognize any of them from David's previous books. The poet David Meltzer is living in an abandoned stone house out in the country at the top of a hill. I go to visit him there with Tsila (and later Mike Castro appears there as well). We are the only ones who know he is there; in effect, he is in exile there. The stone room he is staying in is round, and the wind whips inside of it. I see that his bed has very few covers at all, and I can't understand why he doesn't get a heavier cover, especially because of the wind. He is staying in town for a while and he insists on staying there, or even feels that he has no choice but to stay there, although I think he could probably afford to stay in a motel. I try to close the windows in the round abandoned bedroom so that the wind won't strike him so powerfully, but when I check them I find that the windows have already been closed as much as they can, considering their broken condition, and that there's nothing that can be done to lessen the wind there. While I am there Meltzer tells me that he is depending on me to get him food, especially soup, as many cans as possible. I tell him that I will go to a discount store and buy a large number of Campbell soups, but he tells me that is exactly what he doesn't want because everything in those soups has been ground down. In the dream I'm a little annoyed that he doesn't tell me exactly what kind of soup he likes, only what he doesn't want. As we leave, Meltzer walks with us on the right, with Mike Castro between us, and me to Mike's left. Meltzer says something about leaving the key to the stone house and I put my arm on Mike's shoulder and joke about leaving it for me, but I notice that he and Meltzer are deep in conversation and don't hear me at that time. I feel a bit left out. David Meltzer comes to visit me. I'm glad to see him. We are talking together in my room upstairs, which is filled with small children and a lot of other people. I give him a thick literary magazine I've found that I know he'll love. It consists of copies of manuscripts of poets, showing the drafts of their poems.